The All Stitched Up gallery displays completed Anna Pearson Needlepoint kits in a variety of schemes, some non-standard. You can see that the designs have been incorporated into several different types of item, such as bags, stools and soft furnishings. Annette and Beatrice needlepoint designs stitched by Jennifer Hignell, of East Lothian (right). India design stitched by Elizabeth Ann Watson of Edinburgh (left). McIntyre rug stitched by Loveday Spencer of Hexham	(right). 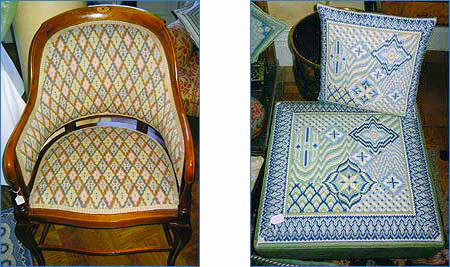 Frederick's Florentine design chair stitched by Anne Swallow, Northumberland (left). 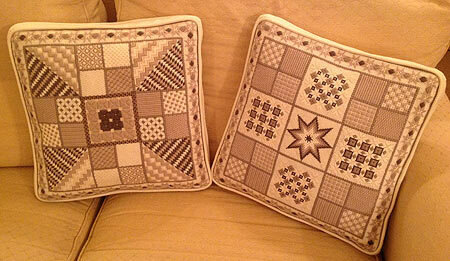 Connie design cushion and stool stitched by Nikki Bell, Edinburgh (right). Tartan design stool stitched by Harriet Benson, Northumberland (left). Tamara design (own colours) stool stitched by Willa McWhannell, Edinburgh	(right). 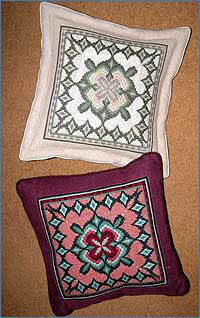 Frederick's Florentine design rug stitched by Gai Bradbeer, Northumberland (left). Siena Custom scheme stool stitched by networker Judith North (right). Caroline design, scheme II, stitched by Judith North (left). Fiesta design, scheme I, bag stitched by networker Claudia Brilli Rome, Italy	(right). Florentine design columns, scheme I, bag stitched by Colette Raw Oxford, England (left). Jewels design, custom scheme, stitched by networker Sara Stonor (right). Jewels design, scheme III, framed stitched by networker Claudia Brilli Rome, Italy (left). Morrocan Tile design, scheme III stitched by Fizzy Chambers	(right). 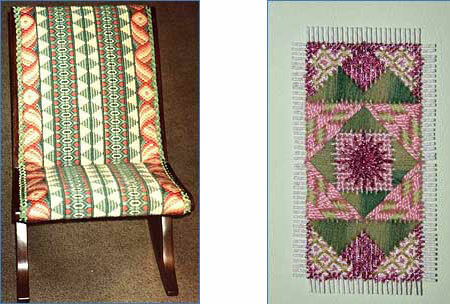 Florentine design columns, adapted scheme, chair stitched by Ann Banks (left). Favor centre design, greetings card stitched by Judith North (right). Alex design, scheme II (bottom), stitched by Judith North and Alex scheme III (top) stitched by Anna Pearson.